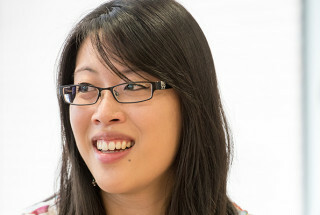 Jean joined Altmetric in 2012, initially as the data curator and blog editor. Today she is the Head of Product, and is responsible for understanding the needs of Altmetric’s users, shaping the roadmap, and working with the development team to deliver great software. Jean holds a Master’s degree in Neuroscience and Pharmacology. I’m responsible for understanding the needs of the research community and incorporating their ideas into Altmetric’s product vision. My main role is to direct product development and (along with our senior management team) set the company’s roadmap. In an average day I serve as the Product Owner of Team Hypercube, a development team that works on new features and maintenance for the Altmetric Explorer, Badges, APIs, and other commissioned projects. I manage a team of staff who specialize in product support, customer implementations, and design. I also frequently speak with users and travel to conferences to better understand what the research community wants to achieve using altmetrics data. The best part of my job is working with a creative and talented cross-functional team to build beautiful software for the research community. The most interesting thing I’ve learnt since starting at Altmetric is that feature prioritization is a fine art. One of the challenges of working in a small team is that we can’t possibly build everything that is requested of us! But if we consistently share our product vision and well-reasoned explanations with our users, then that really helps to convey where we are going and why we’ve chosen to develop certain features over others. The thing I’m most looking forward to next is traveling to Australia for the first time to attend a Digital Science Showcase event. I’m really excited to meet with our fantastic customers and users who are based in the Asia-Pacific region.